How often do you find yourself with a pot of leftover rice, quinoa, or other whole grains? If it’s as often as I do, you’ll want to have recipes like this in your back pocket for dinner the next night. This casserole is so delicious, your family won’t notice that it’s last night’s leftovers cleverly repurposed! 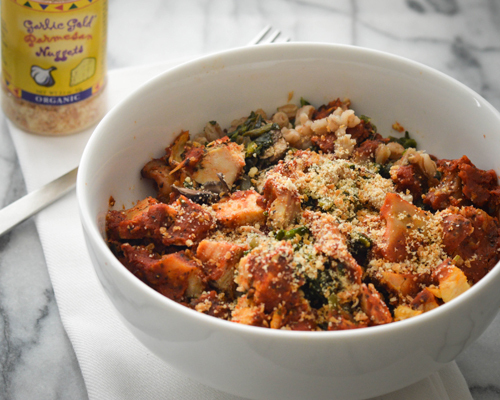 Cooked farro (or brown rice, or quinoa, or bulgur wheat — use whatever you have on hand) is layered with frozen spinach, sliced mushrooms, cubed cooked chicken, and a jar of marinara sauce. The sum of the dish is far greater than its parts, and it’s good for you, too. Topped with a generous sprinkle of Garlic Gold® Parmesan Nuggets, it has lots of cheesy flavor without the calories and fat of lasagna or other classic Italian meals. Preheat oven to 425F and lightly oil 9-inch by 13-inch casserole dish with Garlic Gold® Oil. Spread out an even layer of the cooked grains in the casserole, then top with the sliced mushrooms, spinach (it’s fine if it is frozen, as it will thaw as cooks), and chicken. Pour the marinara sauce evenly over the top of the chicken. Cover tightly with aluminum foil, then bake for 45 minutes. Remove from oven, ladle into bowls, and top generously with Garlic Gold® Parmesan Nuggets. Unfortunately, clicking on “Print” for your Farro Spinach Chicken Bake recipe only opens a blank window and then…nothing. Beta testing would’ve helped to avoid this. BTW, I never thought of Parmesan as having a “cheesy flavor.” The inclusion of your Garlic Gold® Parmesan Nuggets with a marinara, or other Italian sauce, with the Italian grain, Farro, would instead give this recipe a distinct Old World essence. Perhaps a nice Chianti would also enhance the dish?